Wow! 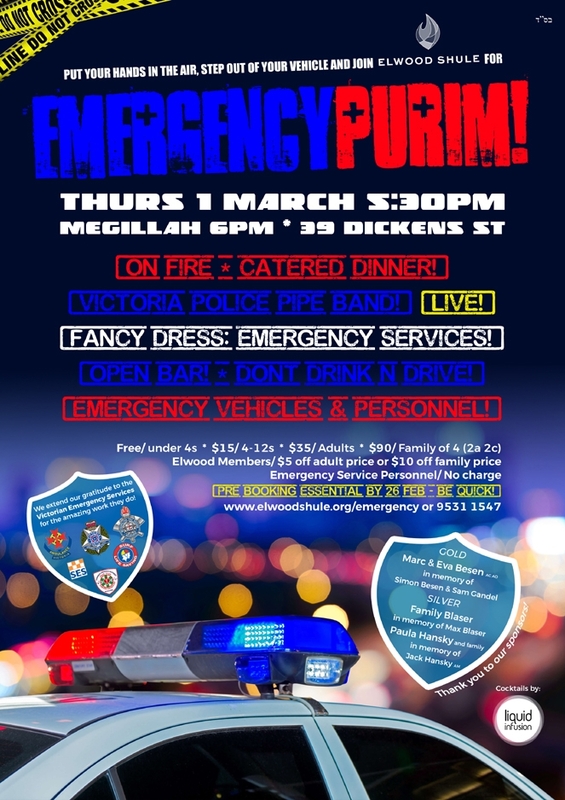 What a fantastic Emergency themed Purim function!! Close to 200 enjoyed the great energy, food, fun and entertainment! A huge thank you to our sponsors - families Besen, Hansky and Blaser. A big thank you to all who helped plan, set up, feed, entertain and clean up, specifically and to all who came and added to the Ruach!! Thank you to the members of our Emergency Services – Victoria Police, Ambulance Victoria, Metropolitan Fire Brigade and Life saving Victoria - for attending and contributing to the spirit and success of the event! Thank you to Peter Unger Catering for the delicious food and to Liquid Infusion for the awesome drinks! All the surplus food was delivered on the night to the Pekelach organization, who in turn were able to feed many underprivileged local families.